* Dario Azzellini and Michael G. Kraft, eds. 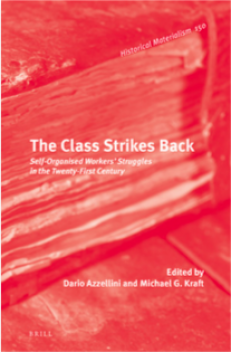 The Class Strikes Back: Self-Organised Workers’ Struggles in the Twenty-First Century. Brill, 2018. The Class Strikes Back examines a number of radical, twenty-first-century workers’ struggles. These struggles are characterised by a different kind of unionism and solidarity, arising out of new kinds of labour conditions and responsive to new kinds of social and economic marginalisation. The essays in the collection demonstrate the dramatic growth of syndicalist and autonomist formations and argue for their historical necessity. They show how workers seek to form and join democratic and independent unions that are fundamentally opposed to bureaucratic leadership, compromise, and concessions. * Virginia Doellgast, Nathan Lillie, and Valeria Pulignano, eds. Reconstructing solidarity: Labour unions, precarious work, and the politics of institutional change in Europe. Oxford University Press, 2018. Work is widely thought to have become more precarious. Many people feel that unions represent the interests of protected workers in good jobs at the expense of workers with insecure employment, low pay, and less generous benefits. Reconstructing Solidarity: Labour Unions, Precarious Work, and the Politics of Institutional Change in Europe argues the opposite: that unions try to represent precarious workers using a variety of creative campaigning and organizing tactics. * Ian Greer, Matthias Knuth, and Flemming Larsen. The Marketization of Employment Services: The Dilemmas of Europe's Work-first Welfare State. Oxford University Press, 2017. Across Europe, market mechanisms are spreading into areas where they did not exist before. In public administration, market governance is displacing other ways of coordinating public services. In social policy, the welfare state is retreating from its historic task of protecting citizens from the discipline of the market. In industrial relations, labor and management are negotiating with an eye to competitiveness, often against new non-union market players. What is marketization, and what are its effects? This book uses employment services in Denmark, Germany, and Great Britain as a window to explore the rise of market mechanisms. We look forward to discussing our research with you all then. Please do come and celebrate with your colleagues the end of the long, painful (rewarding) process that is book-writing and edited volume-organizing!